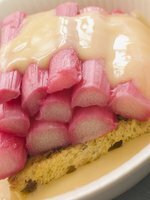 Like the parfait, rhubarb-trifle is layered with cake and custard. A parfait is much smaller. A traditional trifle is quite a bit larger and put into a specialized bowl that resembles a huge brandy snifter. The British are responsible for creating this lovely dessert, but with a slight twist. Though a luscious dessert, a traditional English-trifle was specifically designed to serve as a centerpiece on formal dining tables. Because of the layering, the colors of the fruits and just the sheer size of the bowl, a trifle-centerpiece would indeed be a beautiful compliment to the table. 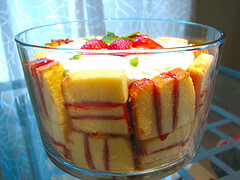 The traditional trifle uses different sizes of cubed sponge or pound cake. The cake can be soaked in sherry or fruit juices. 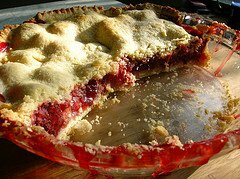 This is layered with jam or fruit compote. Custard is mixed in as well. Variations of the English trifle have occurred over the years. Cake and the custards match each other for taste, for example. Berries are mixed and added for taste and to promote visual appeal. Fresh fruits have replaced the original jam that was traditionally used. Whipped cream can replace the original custard used in the traditional trifle. 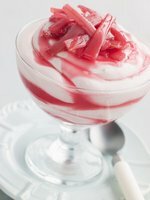 You may not intend your rhubarb-trifle to be a centerpiece, but this dish will certainly make an impression anywhere placed I'm sure. Be sure you have a large deep glass bowl before starting. If you prefer to use whipping cream, take a look at this helpful video first. 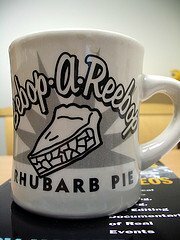 Combine the rhubarb, water and 2 cups of sugar in a medium saucepan. Bring to a boil over low heat for approximately 10 minutes until mixture becomes a sauce. Dissolve the cornstarch in the 3 tblsp. of water and stir into the rhubarb sauce. Simmer for 5 minutes. 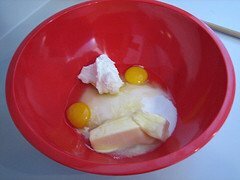 In a separate saucepan, whisk the egg yolks, sugar, cornstarch, salt and milk. Cook over low heat until thickened. Add the butter and vanilla. Top with saran wrap and let cool. Use any sponge cake or pound-cake (homemade or store bought) and cut up into small cubes. Put 1/2 of the cake pieces into your trifle bowl. Add only 1/3 of the cooled custard. Top with 1/3 of the rhubarb mixture. Repeat this process and end with the custard on the top. You can add whipped cream directly over the custard if you like. Garnish the surface with any kind of small berries, or crumbled nuts. 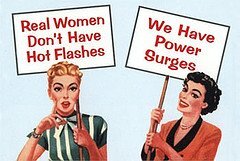 Or simply leave plain. Mix the sugar, orange juice and rhubarb in a saucepan. Bring to a boil over medium heat. Reduce heat and simmer for 10 - 15 minutes, stir occasionally. When rhubarb is tender and mixture is thickened, remove and let cool. Refrigerate for a few hours and stir in the strawberries. Mix pudding mix and milk in a saucepan. Cook 7 minutes and bring to a boil. Remove from heat and let cool. Refrigerate for 2 1/2 hours and fold in whipped topping. Cut pound cake into small pieces. Place half in the bottom of the trifle dish. Cover with half of the rhubarb mixture and top with half of the pudding. Repeat these layers, ending with pudding. Garnish with pieces of strawberry and orange zest. Refrigerate for at least 3 hours before serving.